Stevia is a commercial name for an artificial sweetener and is also the common name for the plant that it is extracted from. 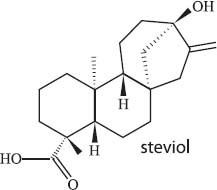 Steviol is the basic structure of this class of sweetener, but when sugar molecules are attached to steviol (making it steviol glycoside) its sweetness skyrockets to hundreds of times that of regular sugar. This sweetener has been in use for centuries in South and Central America and in Japan since the 1970s. In the United States, it’s only been available for a few years as a purified compound (marketed under the name Truvia®); raw plant extracts of the stevia plant are not approved for use in the United States.